I'd do new ATF and filter if it hasn't been done in a while. 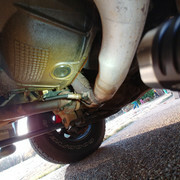 Check the anti-sway bar end links too, those are kind of common to make odd noises when one breaks. Hopefully it's something small like that, versus body mounts, or trans/engine/carrier mounts etc. Did some work on the truck... Found my brake caliper bolts on driver side were a bit loose... Tightened them up and.. Clunk seems to have been fixed. Also replaced belt and lower idler pulley and the engine bay sound seems to be fixed as well. Now I'm trying to find the best procedure for the transmission fluid.. I've found like 10 different methods, lol. It looks like my torque converter has a drain plug (at least it has a plastic looking cap on it on the bottom of the torque converter, I didn't pop it off to look under it). I'd like to get all of the fluid flushed out. What is VB? Valve body? I may put in a new pan. Saw a pan with a drain plug on Amazon for only $30 or so (though sadly it's not a deep pan). Looks like the AMSOIL OE Multi-Vehicle Synthetic Automatic Transmission Fluid is about $100 for 15 quarts which isn't to bad (give some extra headroom and leftover fluid) and the AMSOIL Signature Series Multi-Vehicle Synthetic Automatic Transmission Fluid is about $145... Not counting shipping/tax. Not sure if the difference between the 2 fluids is worth almost $50? Worthwhile to run Engine and Transmission Flush before full drain and fill? Also may end up doing the power steering fluid as I noticed it was a bit low and topped it off and saw that it was pretty funky looking, lol. Manual says to use ATF mercon fluid which is what I topped it off with but I assume I can just use the same AMSOIL ATF fluid above that I end up going with (which is also what is listed as the fluid to use for power steering on the truck)? Or, go with something like AMSOIL Multi-Vehicle Synthetic Power Steering Fluid? Reading someone else who did a flush it sounded like they used 7 quarts.. does 7 quarts sound like how much I would need for the power steering flush? The manual just says fill to the fill mark, lol (so helpful!) lol. I did find a nice 2000 explorer spec sheet but it also does not list capacity. 7 quarts sounds like way, way too much. Count on just under 1 quart. Capacity empty is just under a quart. You might need 2 quarts, depending how you do the flush. I flushed my PS not very long ago, when I heard the "PS whine" that was the idler pulley. I bought a gallon of the store brand PS fluid at Advance or Autozone. It's super easy to remove the one bottom hose from the cooler, and stick it down into a large pan(wrench lightly on the end holding it down well). Then most of the fluid will drain, but you can quickly when ready, start the engine and pour the cheap clean fluid in, no harm as long as fluid is in the reservoir. Shut if off, replace the hose, and refill. I've never used ATF for the PS, not since the early 80's with my old Gran Torino. I always use PS fluid for the PS system, I've seen a bunch of Fox Mustangs with terrible rack problems, mostly leaking, but whining or grinding etc. Those cannot be all from random bad PS pumps or racks. The cheap ATF people use is more likely to harm, than any PS fluid. I've only used the Amsoil ATF that they now call OEM/universal. That's all they had before last year, now the Signature is new, and another choice I don't recall. It's all very good. I like their PS fluid, that's what I like to use, but it is expensive. BTW, wee do have some local sources for Amsoil, dealers. I haven't contacted one yet, but I noticed them the last time I was hunting Amsoil online. 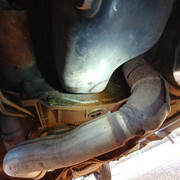 More coolant leak(s)... somewhere.. in the rear... when running, cpl drops (fresh) dripping back on the exhaust piece that the headers connect to right by the TC... wtf. About fed up with it all. Can see some of the coolant on the TC. 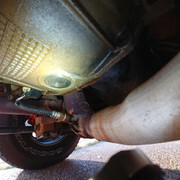 Drips down on the exhaust by that oxygen sensor. May just use some K-Seal and hope for the best. Read good things about K-Seal... Probably a tiny leak with my timing chain cover which I just don't want to mess with. Also... Might be in process of buying a 2017 WRX limited (used, low miles) and would sell off my SVT focus (if I fix the damn starter lol). That K-seal brand sounds familiar. The one I used the most was Alumiseal, it came as a powder in a small clear tube, silver is the normal version. I read a number of reviews and even posts on this forum and everyone said it worked great, sealed the leak(s), and no adverse effects. Ordered a bottle of it off Amazon and will see how it goes this weekend. It seems you are to pour it in (it's a small 8oz mini-jug), run the car for around 45 min to an hr.. and then let it sit for a few days. I hope it works, good products are great to find, and the more the better. I was searching a while ago, and discovered a Lubegard coolant additive I didn't know about. I liked the sound of it, and ordered one along with an "Add-on item"m my favorite dental floss. I recommend this if you need any floss, best stuff and great price. In store it used to be $3ish before the name change, I haven't bought it in store for over a year. All of the hoses that I am aware of are new... Upper and lower radiator, the small t-stat elbow hose, the entire metal tube setup that runs on the top of the valve cover to the heater core hoses, which are both also new, and the heater core valve thing is also new. Which smaller elbow hose are you talking about? I think it is called the water pump bypass hose. Water pump to thermostat housing. Ahh, then yes, that one is good.. Not leaking. K-Seal works. I used it to stop a timing cover leak once. Then it started leaking again after I back flushed it with the engine running. Doh! Are you sure it's not from when you replaced the heater tube? Forget to a tighten a hose from the tube to the core? Triple checked that entire area and found no leaks from any of the connections from the tube on either end.